The Ruger 10/22 has been enormously popular since it was released more than 50 years ago. Due to that popularity (and probably also contributing to it), the 10/22 has one of the most impressive markets for third-party accessories and upgrades. Like the Glock and AR platforms, you can even build a 10/22 entirely out of third-party parts, were you so inclined. Now we’ve talked about the best upgrades that you can make to your Ruger 10/22 in the past, but one thing we didn’t discuss was receivers. Sure, the OEM Ruger receiver gets the job done, but if you’re looking to take your 10/22 to the next level…or are doing the build yourself, these are our favorites. Only introduced in spring of 2018, the Brownells BRN-22 receiver for the Ruger 10/22 is a relative newcomer, but Brownells is an old pro when it comes to creating high-quality gun parts. The BRN-22 receiver comes in a variety of configurations, so it’s the receiver on this list that should work for the most people. To start, you get to choose between a stripped receiver and a barreled receiver. Either way you go, you can also choose between the standard BRN-22 model, a factory style 10/22 receiver, or the BRN-22R model, which is machined with an integrated Picatinny rail, for something ideal for upgrades. If you opted for the stripped version, your decision making ends there, but if you went with the barreled option, you have to consider your barrel options. Brownells offers their barreled receivers with either 10” or 16” barrel lengths. The 10” is only available with a sporter type barrel, but if you go with the 16”, you can choose between sporter and heavy barrel styles. Whichever barrel you go with, it will have 1/2″-28 TPI threads for attaching your preferred muzzle accessory. 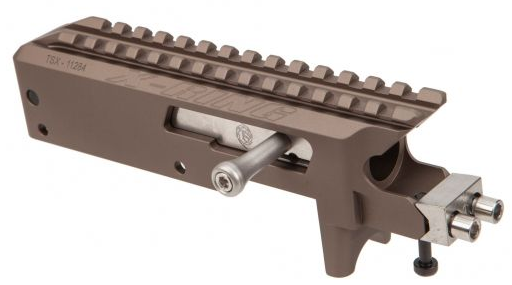 Just a heads up: the barrel doesn’t come installed, so you’ll have to do that yourself, and Brownells doesn’t provide a thread protector, so you should probably pick one up too. All of the BRN-22 configurations are machined from 6061 aluminum with a matte black hard coat anodized (barrels have a matte black oxide finish) and have a pre-drilled rear cleaning rod access hole. On top of all that, these receivers are super affordable, making them a great option if you’re doing a low budget build. What’s your take on the BRN-22? Volquartsen is one of my favorite brands for 10/22 upgrades, and their 10/22 Superlite receiver is just one more excellent piece that they offer. 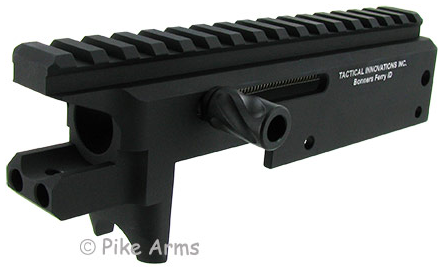 Unlike any of the BRN-22 configurations, this receiver is complete, but with no barrel. It does, however, utilize Volquartsen’s tapered cone bushing installation system. This helps to impede barrel canting, which can often occur with 10/22 barrels and allows the receiver to be used with any 10/22 barrel. The Volquartsen Superlite receiver is made of CNC machined high-grade 416 stainless steel and has an installed, but not integrated, Weaver-style rail. It also features a synthetic recoil buffer, which minimizes recoil and quiets the action. While it certainly looks similar to the OEM receiver, you’ll definitely be able to feel the difference – and so will your wallet. If you’ve done much upgrading, building, or modding of guns before, then you’re probably already familiar with Tactical Solutions. If you’re not, Tactical Solutions has an excellent reputation for creating a lightweight yet high-quality firearms, accessories, and upgrades, especially barrels. With that level of expertise, it’s no surprise that their X-Ring 10/22 Receiver is a favorite among Ruger 10/22 fans. Unlike the other receivers we’ve discussed so far, the X-Ring 10/22 Receiver is machined from billet aluminum to reduce weight while maintaining durability. Altogether, the receiver, along with its included heat-treated stainless steel bolt, weighs just one pound. It has a dual spring guide rod system that makes the bolt mechanism more flexible, reduces recoil, and allows rounds to cycle more smoothly. The receiver comes in both standard and takedown versions, the latter of which can be a bit difficult to come by. Both have integrated Picatinny rails, perfect for adding your optic of choice. It’s also available in silver, gunmetal gray, black, O.D. green, and quicksand, so it has the right look for any 10/22 style, whether simple and classic, modern and tactical, or somewhere in between. The X-Ring 10/22 Receiver also has rear cleaning rod access, making it easy to clean. With all that said, this excellent receiver comes at a price and that’s, well, the actual price. While fantastic, the X-Ring 10/22 Receiver costs quite a bit more than just buying a brand new 10/22, so if you’re on a budget, this probably isn’t the best option for you. If a receiver from Volquartsen or Tactical Solutions isn’t quite within your budget, take a look at the Elite22 line of receivers from Tactical Innovations. 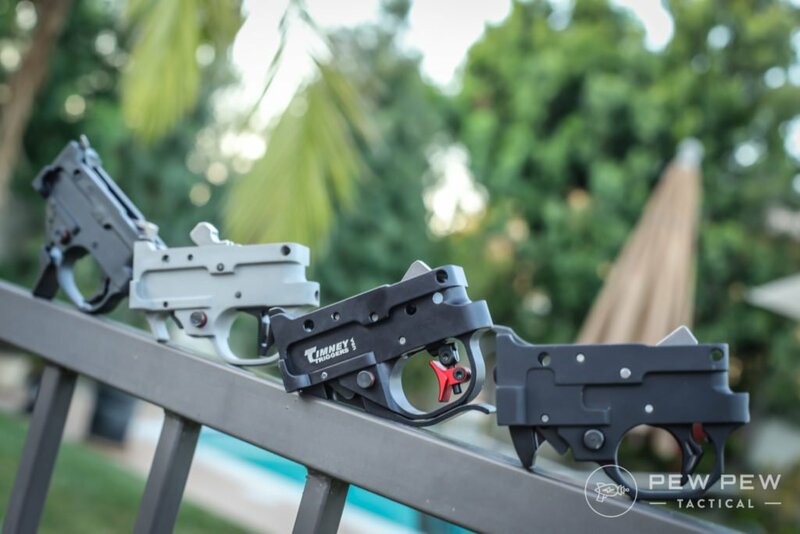 The standard Elite22 receiver is made of 6061 T6 aircraft grade billet aluminum and is available totally stripped or with a match grade bolt assembly. It has an integrated mil-spec Picatinny rail and rear cleaning rod access. The receiver has an anodized finish available in matte black and a variety of bright colors to suit any aesthetic, including silver, gold, red, blue, and purple. The bolt assembly, should you choose to get it with your receiver, is available in polished stainless steel, matte stainless steel, and black nitride finishes. But that’s just the standard configuration. 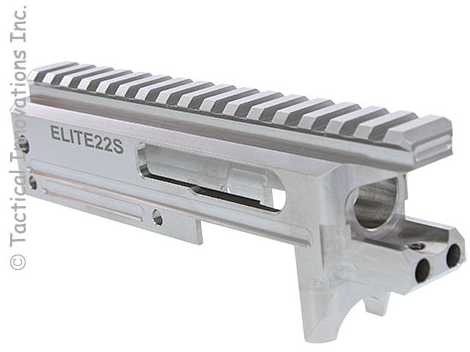 If you prefer stainless steel, Tactical Innovations has that, too, with their Elite22S model made from 416 ordnance stainless steel. It has the same specs as the aluminum version, aside from material obviously, but it’s only available in polished stainless, matte stainless, and black nitride finishes. However, it’s also available in an 80 percent version as well as a version with a fluted .920 target bull barrel, so I guess you win some and you lose some. Do you love your 10/22 but wish it was a bit more lefty friendly? 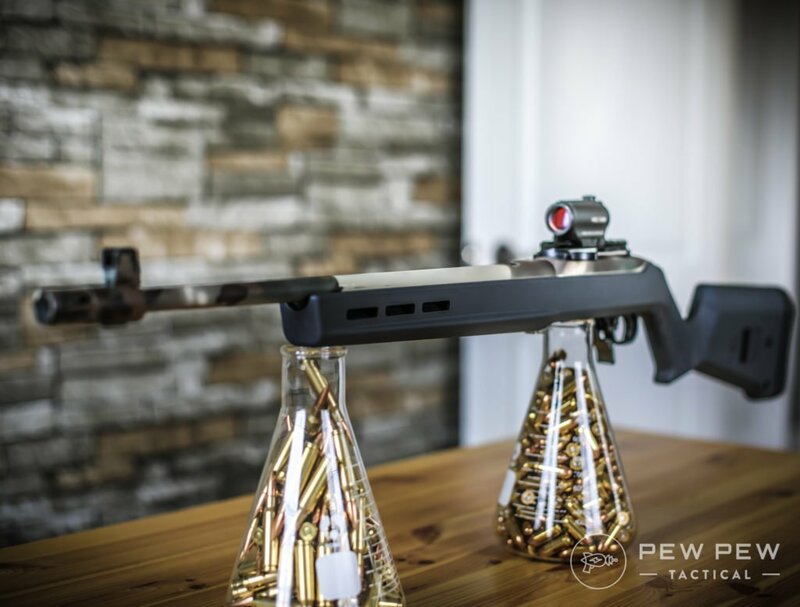 Are you going with an AR-inspired 10/22 build or upgrade? 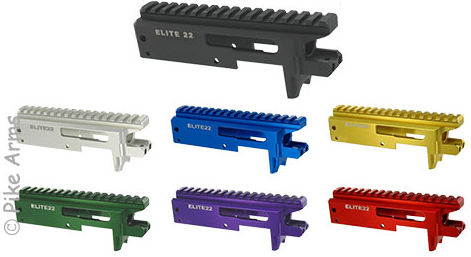 Then you need the Elite22LC. It’s the exact same as the standard Elite22, right down to the availability of finishes, but with a charging handle on the left side. It’s perfect for lefties (or righties who prefer to keep their firing hand in position) or those going for a more AR-like feel for their 10/22. All of these receivers in all of their configurations are great, especially for the price, so no matter which one you go with, you’re sure to be pleased. But don’t forget that completed receivers must be shipped to an FFL by national law, and many manufacturers only ship even stripped receivers to FFLs rather than dealing with state and local legislation on the subject. Make sure you know if you’ll need to have your receiver shipped to an FFL before you order to make sure there are no delays in receiving your receiver (I know, I know. I’ll see myself out). Everything about the 10/22 can be upgraded, as we’ve said – but the best upgrade is likely the trigger. Our Best 10/22 Triggers article is a great place for you to start! Working on an awesome 10/22 build or upgrade project? Know of another great aftermarket 10/22 receiver that didn’t make my list? And check out the rest of our Best 10/22 Upgrades…from stocks to sights and more. What about the all stainless MOA receiver that can use threaded barrels instead of the slip fit? It also has a rear lug for better bedding. 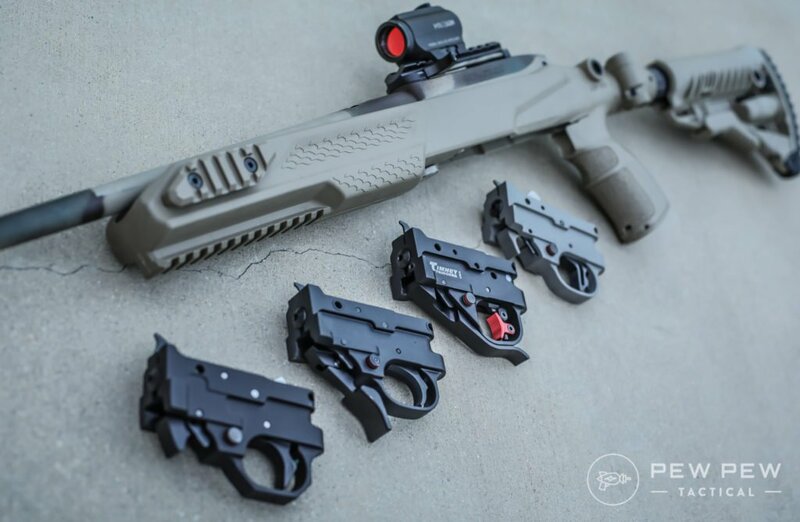 How about sharing what your 10/22 conversion kit is made up of; parts, etc. I would rate KIDD at the top and I don’t even see it listed????? ?